I must admit that I have found it really difficult of late to write a blog post. It is not because nothing has happened, more, lots of things have happened. My mental state is much more stable now, although I do have off days. Even on my off days though, I find that I am now able to control things much better, my dependency on medication has decreased, and I am getting good at recognising ‘bad’ negative thoughts. The one thing I do not seem to be able to do though, is to read all my old posts. It may sound strange but I just can’t bring myself to do it, I just shudder at the thought. Even writing this is giving me the knot of anxiety in my chest. My plan was to sort all my old posts into some form of order, tidy this site up a bit and then continue to chart my progress. Trouble is I just do not want to go back, I know I have too, I just can’t. This in some strange way seems to be holding me back, as if I was repressing something, but how can I repress such recent things? Do not get me wrong, I have not forgotten what has happened, I have forgotten what I have written. I know that a lot of raw emotion has been put into some of my posts and I don’t know if I am able to revisit it all just yet. Also there is the problem of my atrocious grammar and spelling but nothing has changed there. I suppose it is like picking up a book you started but never finished, you start again from where you left off but you can’t quite get into the story again. You know it would be better to start from the beginning again, but you just don’t because you remember enough to make that sound like a chore. My problem is that my blog has come to be my outlet, this is where I air my thoughts, troubles, triumphs and failures. I do not do it for people to read, it is my scream into the wind. 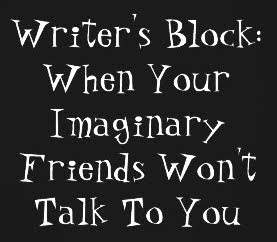 So ‘blog block’ is causing me a little bit of mental agitation, I just want to speak so much but can’t! Where once I could sit down and the words would just tumble out and within an hour a long rambling post was born, now, I struggle to string a sentence together. So that is where I am, in blog, in mind, and in spirit, blocked. I have mental constipation! I need a mental laxative to get me flowing again, I apologise for the potty humour but it just fits, and I am sure that there are some that will say that as all I do is talk crap, it is very apt. For me you see, blogging is a Pandoras box, until I write, I often do not know what is wrong. Until I wrote this, I really did not know that reading my old posts was such an issue, or that I was avoiding it. Now though I do, which kind of makes this whole post seem irrelevant. Though knowing the cause of my mental constipation is good, I still need to find my laxative.